Workplace injuries are often serious, and they prevent employees from going to work for days, weeks or longer. Even when employees return to work, they may be unable to do everything they used to do, which can hurt their paychecks. This is why employees have the right to pursue workers' compensation benefits to cover medical expenses and lost wages caused by their injuries. If you have been injured in the workplace, the Knoxville workers’ compensation lawyers at Greg Coleman Law can help determine if you are eligible to receive compensation for your injuries. There are no upfront fees for us to handle your case. We only get paid if we obtain the benefits you deserve for your workplace injury or illness. Our attorneys have in-depth knowledge of the workers' compensation process in Tennessee, including the rights of injured workers and the benefits available. For more information about how our personal injury lawyers can help you, contact us today by calling (865) 247-0080 or completing our Free Case Evaluation form. There are certain exceptions to these rules, but generally, if a worker in Tennessee has been injured on the job, chances are his or her employer is required to provide workers’ compensation benefits. As you can see below, there are many aspects to understand about workers' compensation benefits. This is one of the reasons you should strongly consider working with an attorney. An experienced Knoxville workers' compensation lawyer will know how to determine the value of the benefits you are owed. This way, if you do not receive what you are owed, your attorney can help you to appeal. Your future medical treatment related to the injury will also be covered as long as it is authorized by the authorized treating physician. Once you report your workplace injury, your employer should provide you with Form C-42 Agreement Between Employer/Employee Choice of Physician. This form will list three independent doctors who are not practicing in the same location and are within the injured employee's community. You must choose a physician from this list. If your doctor says you cannot work, or you cannot work in the same capacity as before your injury, you are entitled to temporary disability benefits equal to 66 and two-thirds percent of your average weekly wages (AWW) from before you were injured. If you are completely unable to work, you are entitled to temporary total disability benefits, because you are totally disabled. If you can still do some work, or you have to work fewer hours than normal, you are entitled to temporary partial disability benefits. These are equal to two-thirds of the difference between your wages after the injury and your average weekly wages. In other words, if you are earning $200 less, you would be entitled to about $130 in benefits. Temporary disability benefits must be paid out starting on the eighth day you are disabled. (The insurance company is required to begin paying these benefits no more than 15 days after receiving notice of your injury.) You will only be paid from that point forward. You will not receive payment for the first eight days unless you are disabled for at least 14 days. If you are permanently disabled, you may be entitled to permanent disability benefits. If you have a permanent disability but are still able to work in the open market, you are entitled to 66 and two-thirds percent of your AWW. This is the same amount you will receive if you are totally disabled and completely unable to work. If you are receiving permanent total disability, it will continue until you become eligible for old-age retirement under the Social Security law. The permanent disability benefit process begins when your authorized treating physician assigns a permanent impairment rating based on guidelines from the American Medical Association Guides to the Evaluation of Permanent Impairment. Wage replacement – If there are no dependents, the estate shall receive $20,000. If there is a surviving spouse and no children, the spouse will receive 50 percent of the employee's AWW, up to the maximum weekly benefit limit. If there is a spouse and one or more dependent children, the spouse will receive 66 and two-thirds percent of the AWW. Burial expenses – Burial expenses are $10,000 for deaths occurring on or after May 19, 2017. Benefits are only $7,500 for deaths prior to that date. Tennessee's Department of Labor & Workforce Development connects permanently disabled injured workers with the Next Step Program, which is a vocational rehabilitation fund to assist these workers in getting the training they need to work again. You can receive a scholarship for tuition and mandatory fees worth up to $5,000 per year. The most you can receive for all the years you are eligible is $20,000. You can use the scholarship for any public post-secondary institution in Tennessee that has been designated by T.C.A. § 50-6-208(j). You can also use it for any business that is contracted with the state for vocational training or assessment, job analysis, employment training or general education services. Our Knoxville workers' compensation lawyers can help you pursue the benefits you deserve for your injury. If necessary, we can also contest the rating of your permanent disability if it is too low. Our goal is to get you the compensation you need to move forward from this difficult part of your life. Fill out a Free Case Evaluation form today or call us at (865) 247-0080. You need to know what to do after suffering an injury at work if you want to obtain the benefits you deserve. The first step is to immediately report your injury to your supervisor. For injuries that occur on or after July 1, 2016, you must notify your employer within 15 calendar days of when you knew or should have known about the suspected injury. If you do not report the injury before this deadline, you may lose your right to benefits. It is best to report the injury immediately, to avoid raising suspicion from your employer or its insurer about whether your claim is valid. Once your employer is notified, it must submit First Report of Work Injury or Illness (Form C-20) to its insurance carrier within one working day, even if the employer does not think the injury is work-related. Once the report is made, your employer must help you get all the medical care you need from the doctor you choose from the employer's approved list (Agreement Between Employer/Employee Choice of Physician (Form C-42). You must select a physician and sign the form and you will be provided with a copy. Your employer is also required to provide a Wage Statement to its insurance adjuster, detailing your gross wages earned, including overtime and bonuses for each of the 52 weeks before the injury. A decision on your claim must be made within 15 days of you providing verbal or written notice of an accident or injury. If your claim is approved, the insurance adjuster must immediately file Notice of First Payment of Compensation (Form C-22). If your claim is denied, the adjuster must file Notice of Denial of Claim for Compensation Form. Our Knoxville workers' compensation attorneys can help you with applying for benefits. We can help ensure you provide the relevant information to support your claim of a work-related injury. And if your claim is denied, we know how to appeal the decision and fight for your benefits. Unfortunately, some workers' compensation claims are denied or workers are not given the benefits they feel they deserve. Fortunately, you have the right to appeal the decision on your claim. You have one year from the date of your accident or injury, last payment of benefits or last authorized medical treatment, whichever occurs later, to file a Petition for Benefit Determination. Send the form to the regional office that is closest to your home. The form has contact information for the different Bureau of Workers' Compensation (BWC) offices throughout the state. If the dispute in your case involves medical treatment or temporary disability, you will be referred for mediation. The BWC will provide a neutral third party to help reach a voluntary agreement between you and the insurance company. The mediation session may occur in person or over the phone, and usually takes place within 20 days of you submitting a petition. If the mediation is unsuccessful, the mediator will issue you and the Clerk of the Court of Workers' Compensation Claims (CWCC) a Dispute Certification Notice. If you want to continue the appeal process, you need to file a Request for Hearing with the CWCC Court Clerk. A workers' compensation judge will issue a decision awarding or denying benefits. He or she may order a formal hearing so he or she can go over evidence from both sides in the dispute. If mediation works, the file for your case will be transferred to the CWCC where it must be approved to become binding. Disputes over permanent disability are resolved in a similar manner. Once you reach the point of maximum medical improvement, you must go through mediation. If this does not work, you can request a hearing with the court within 60 days. There will be a formal compensation hearing and the judge will issue a written order. If mediation is successful, the settlement must be approved by a judge at an approval conference. If you are not granted the benefits you deserve by the judge, you can appeal to the Workers' Compensation Board within 30 days, where a panel of three judges will affirm the judge's decision or change it. You may also be able to file an appeal with the Tennessee Supreme Court. Your workers' compensation lawyer in Knoxville can help guide you through every step of the process, including representing you at mediation and at hearings before judges. We know what it takes to overturn a decision, including the evidence we need and points to make when advocating for your best interests. Hearings and mediations can be complicated and difficult to understand unless you have been through them. This is why it can be a big help to have an experienced Knoxville workers' compensation lawyer at your side. 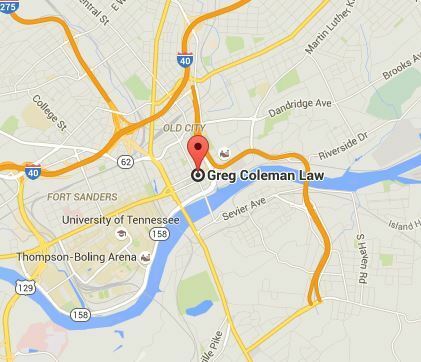 Call Greg Coleman Law today at (865) 247-0080. According to the Occupational Safety and Health Administration (OSHA), every year in America, over four million people suffer a serious job-related injury or illness. More than 4,500 workers die on the job each year. If you have been injured at work and are unsure of the benefits that you may be entitled, contact our attorneys today. We offer a 100 percent FREE case review, that allows our clients to submit the details of their incident, which our lawyers will review and then determine if you have grounds to file a claim. Contact a Knoxville workers' compensation lawyer right away. Call (865) 247-0080. Workers’ compensation benefits give an employee economic stability during his or her recovery from a workplace injury. If you or a loved one has been injured while on the job, you are not alone. At the law offices of Greg Coleman Law, our team of Knoxville workers' compensation attorneys has detailed knowledge of Tennessee's workers' compensation laws and will fight for the justice that you deserve. Your consultation with our attorneys is completely free and comes with no obligation to pursue a case. We do not charge for our services unless you receive the benefits you need and deserve. Call (865) 247-0080 or reach us online 24/7 via our Free Case Evaluation form.